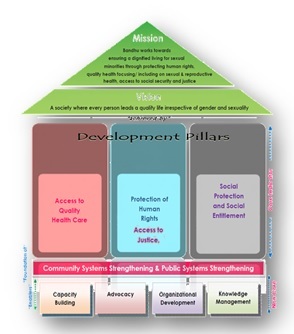 Bandhu operates within its own strategic plan designed for every five years with a focus to achieve organizational mission and vision through ensuring services on SRHR needs and overall wellbeing of gender diverse population of the country. The organization is currently implementing its 4th Strategic Plan (2017-2021) which is developed to ensure that its program interventions on health and health rights through 37 well-equipped field health centers in 23 districts and 26 partner CBOs across the country, can add significant value to national response on health for achieving Sustainable Development Goals (SDGs) particularly 1, 3, 5, 10, 16 and 17.
to live in an environment where their human rights are protected in order to have a minimum acceptable quality of life with dignity and respect like any other human beings. These three pillars shall constitute the key results that Bandhu would like to achieve by 2021, as measured through a set of core-Indicators of Bandhu.